1 & 2. 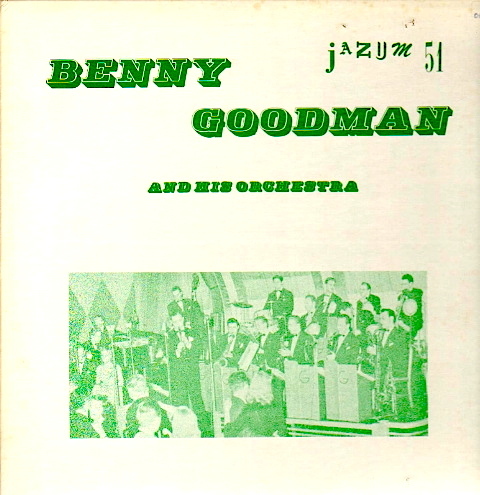 Title: Benny Goodman And His Orchestra 1941-42 / Format: LP / Label: Sunbeam / Cat. Num. : Sb 158 / Rel. 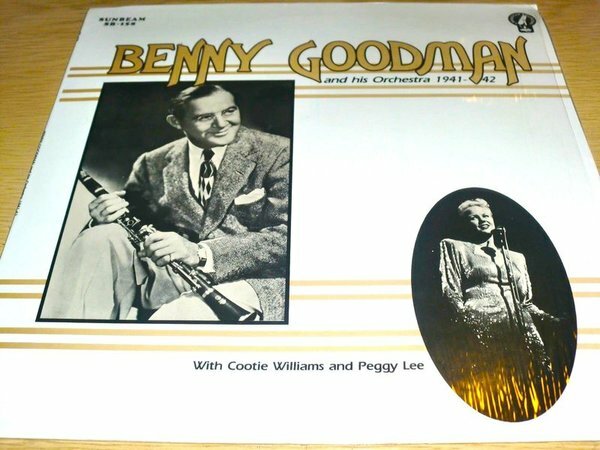 Year: 1984 / Note: This album of Benny Goodman concert performances includes four Peggy Lee vocals, each one sung at a different date but all of them simulcast over the radio airwaves. Her vocals are "Soft As Spring" (October 4, 1941; aired on CBS' Matinee at the Meadowbrook), "The Shrine Of St. Cecilia" (October 26, 1941; aired on NBC's Fitch Bandwagon), "That Did It, Marie" (November 1, 1941; sustaining broadcast on Mutual) and "Blues In The Night" (November 12, 1942; sustaining broadcast on CBS). An oval picture of Peggy Lee that is seen in the bottom right corner of the LP's front cover. Image #2 is a magnified shot of that picture. According to Discographer Ron Towe stated, the photo is from January 1943. I am slightly more inclined to date it 1945 or 1946 date. 3. 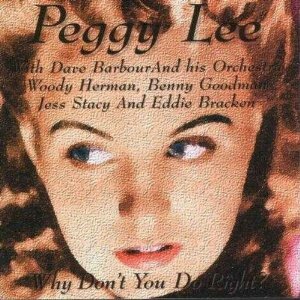 Title: Peggy Lee With The Benny Goodman Orchestra, 1941-47 / Format: CD / Label: Acrobat / Discs: 2 / Cat. Num. : (United Kingdom) Addcd 3216 / Tracks: 44 / Rel. Year: 2017 / Note: Combines Peggy Lee's studio recordings as Goodman's canary with six of their radio remote numbers. Four of the six radio performances were taken from the just-itemized Sunbeam LP. 4. Title: The War Years / Format: LP / Label: Jazz Society / Cat. Num. : Aa 510 / Rel. Year: unknown / Note: This LP includes three Peggy Lee vocals, all of them performed live and simulcast on the CBS radio network. The performances are "Cow Cow Boogie," "Praise The Lord And Pass The Ammunition" (October 19, 1942 in both cases) and "Mr. Five By Five" (November 12, 1942). 5. Title: The War Years, 1943, 1944, 1945 / Format: LP / Label: Musicdisc / Cat. Num. : (France) 30 Ja 5226 / Note: A reissue of the preceding item, it includes 14 of the 16 tracks in the Jazz Society album, with two of Peggy Lee's vocals about the left-out numbers. Only her performance of "Mr. Five By Five" was kept. 7. 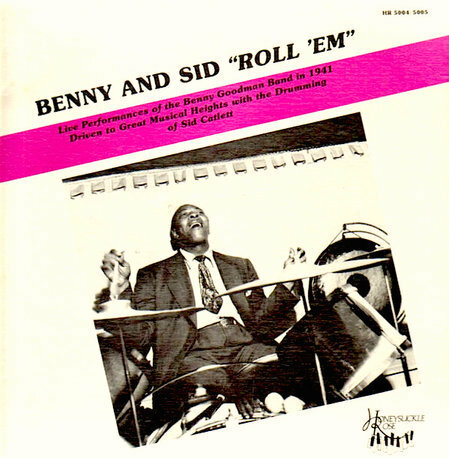 Title: Benny & Sid "Roll 'Em" / Format: LP / Label: Honeysuckle Rose / Cat. Num. : Hr 5004-5005 / Rel. Year: unknown; presumed to be between 1970 and 1989 / Discs: 2 / Note: This gatefold 2LP set contains two Peggy Lee vocals, both culled from concert dates that were simulcast over the Mutual radio network. "When The Sun Comes Out" is from a September 11, 1941 concert, "Smoke Gets In Your Eyes" from a September 16, 1941 concert. 8. 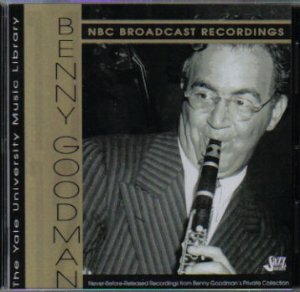 Title: Benny Goodman & Sid Catlett "Roll 'Em" / Format: CD / Label: Vintage Jazz Classics / Cat. Num. : Vjc 1032 / Rel. Year: 1991 / Note: Although not overly identified as such, this is basically a CD reissue of the preceding vinyl. It is no wonder, then, that they share some of the same artwork and, basically, the same title. There are substantial differences, though. The liner notes are different. Also, five of the 25 tracks in the Honeysuckle Rose 2LP set are excluded from the CD. Unfortunately, Peggy Lee's performance of "Smoke Gets In Your Eyes" is among the casualties. More fortunately, "When The Sun Comes Out" is among the included tracks. Space constrictions probably accounted for the exclusions; perhaps poor sound quality on those tracks also served as a deterrent. 9. 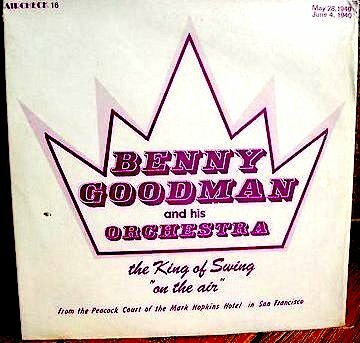 Title: Benny Goodman And His Orchestra; The King Of Swing "On The Air" / Format: LP / Label: Aircheck Records / Cat. Num. : 16 / Rel. Year: unknown / Note: Contains two complete broadcasts from the Mark Hopkins Hotel in San Francisco (neither featuring Peggy Lee) and a couple of excerpts from dates at other venues. Peggy Lee is heard performing "These Foolish Things" during a date at an unknown outdoor location in Chicago, on August 10, 1942. Lee's vocal, along with various Goodman instrumentals from the same live date, were simulcast on an episode of the radio show Bond Wagon Drive. 10. 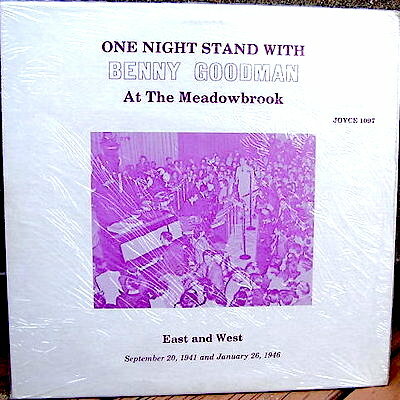 Title: One Night Stand With Benny Goodman At The Meadowbrook / Format: LP / Label: Joyce Record Club / Cat. Num. : 1097 / Rel Year: 1982 / Note: Consists of two Goodman dates, one in New Jersey's Meadowbrook Club (September 20, 1941) and the other in California's Meadowbrook Gardens (January 26, 1946). For the 1941 date -- simulcast on the CBS radio show Matinee at the Meadowbrook -- Peggy Lee sings a rendition of "It's So Peaceful In The Country." This LP (item #6) is actually a reissue of another LP (item #7). 11. 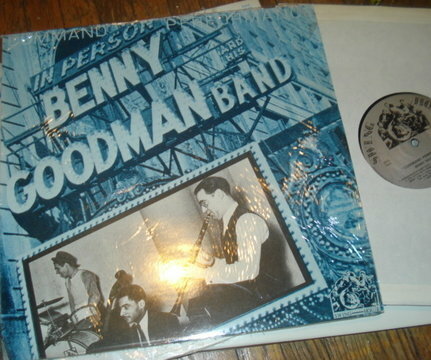 Title: One Night Stand With Benny Goodman / Format: LP / Label: Joyce Record Club / Cat. Num. : 1056 / Rel Year: unknown / Note: Same contents as item #6. The differences between the two LPs are relegated to catalogue number, title, and front cover. As can be seen above, the front cover photos are entirely different. Peggy Lee is seen only in this item's photo. She is on the front left, sitting alongside the band's crooner, Art Lund, in chairs placed next to microphones set up for them. This shot was probably taken on the same night as the one that graces item #8, the date possibly being December 1, 1941. (I have seen the present photo with that date penciled on its back.) 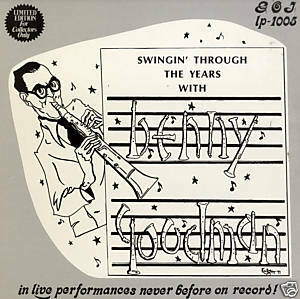 On a separate note, I should also mention that, though Joyce Record Club released other LPs titled One Night Stand With Benny Goodman (e.g. 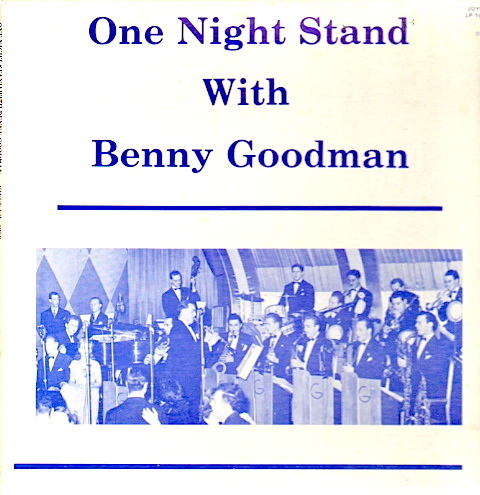 One Night Stand With Benny Goodman At The Click, One Night Stand With Benny Goodman, 1942 And 1943), the two titles discussed herein are the only ones which contain Lee vocals. 13 & 14. Title: NBC Broadcast Recordings, 1936-1943 (The Yale University Music Library Series, Volumes 11 & 12) / Format: CD / Label: Jazz Heritage Society / Cat. Num. : 5262997 / Rel. 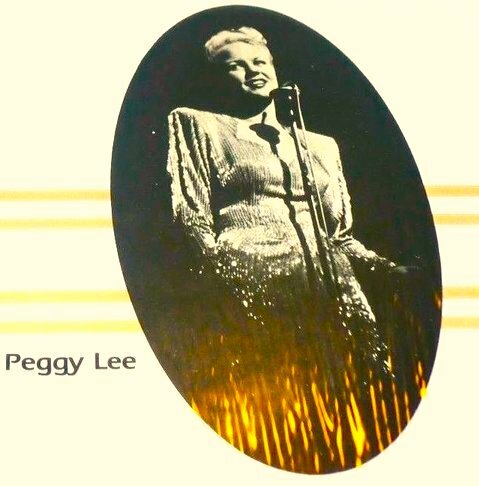 Year: 2007 / Discs: 2 / Note: This 2CD set contains Peggy Lee's vocals for "I See A Million People" and "I Don't Want To Set The World On Fire," both part of a concert simulcast over the CBS radio airwaves on September 17, 1941. The first of the above-seen images (#11) features the front cover of the compact disc, whereas the second picture is the one used for the MP3 edition. My thanks to David Jessup for his full reply to some questions that I had about these items, and for his generous scanning of one of the photos. 15. 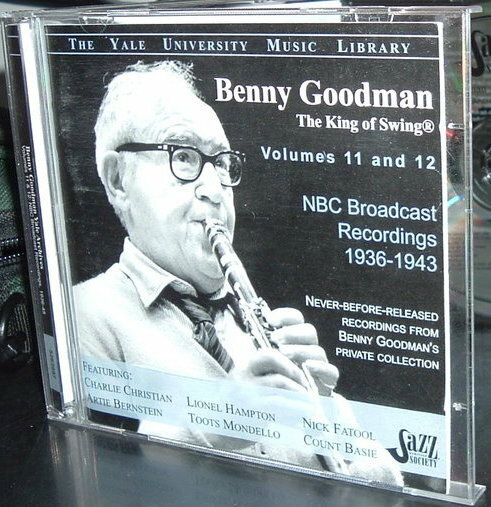 Title: NBC Broadcast Recordings, 1936-1943 (Yale University Archives, Volume 5) / Format: CD / Label: Nimbus / Cat. Num. : (United Kingdom) 2734 / Rel. Year: 2010 / Volumes: 2 / Note: Reissue of the preceding item. 1. 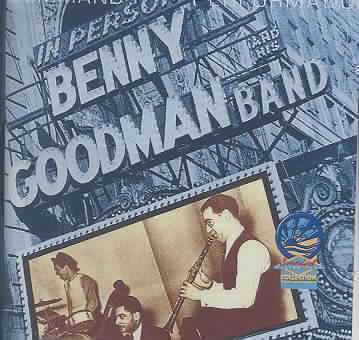 Title: "Command Performance"; Benny Goodman With A Parade Of Stars / Format: CS & LP / Label: Swing House / Cat. Num. : (United Kingdom) Cswk 46 & Swh 46 / Rel. 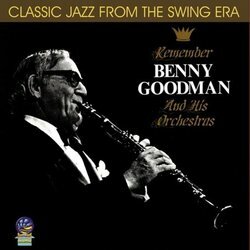 Year: 1984 / Tracks: 14 / Note: The contents of this album stem from various 1943-1944 appearances made by Benny Goodman in live dates and radio shows. One of the radio shows, a 1943 episode of the American Forces Radio show Downbeat, is the source for the Lee tracks. 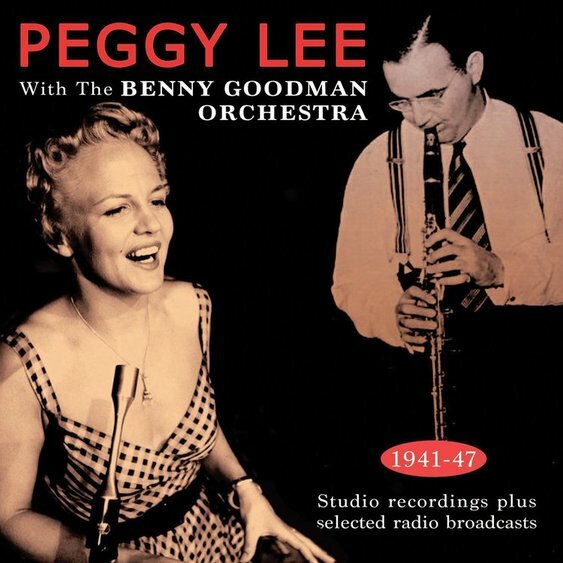 As part of the radio show's script, Benny Goodman lets listeners know that canary Peggy Lee has recently gotten married. We hear her sing three numbers, two of them solo and the other in a vocal duet with Goodman. The Swing House item under discussion includes the duet ("I Love A Piano") and one of the solos ("Why Don't You Do Right? "), leaving out the other, much rarer vocal. 2. Title: "Command Performance" / Format: CD / Label: Sounds Of Yesteryear / Cat. Num. : (United Kingdom) Dsoy 636 / Rel. Year: 2004 / Tracks: 14 / Note: Digital reissue of item #1. 5. 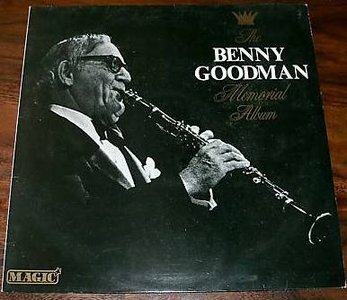 Title: The Benny Goodman Memorial Album / Format: CS & LP / Label: Magic - Submarine / Cat. Num. : (United Kingdom) Cawe 23 & Awe 23 / Rel. Year: 1986 / Note: Released on the year of Benny Goodman's passing. Combines performances from 1943, 1946, and 1961. Lee's one performance is the same 1946 duet with Art Lund ("I Don't Know Enough About You") that is mentioned in item #4. Buyers beware: the Lee-Lund duet suffers from poor handling of its playback. As a result of this problem, Lee's voice sounds terribly distorted and cartoonish -- like a tipsy Minnie Mouse. 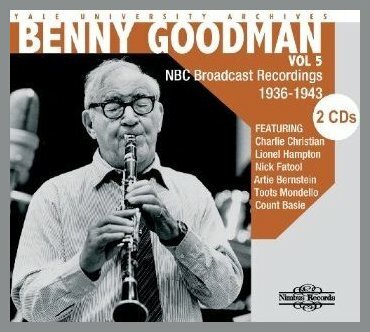 The Benny Goodman Memorial Album has also been reissued on CD; see item #6. Leaving aside the markedly different title, all three configurations (LP, cassette, CD) use the same exact front cover. 6. Title: Remember / Format: CD / Label: Sounds Of Yesteryear / Cat. Num. : (United Kingdom) Dsoy 731 / Rel. Year: 2007 / Note: This CD is a digital reissue of item #5. It suffers from the aforementioned distortion problem, which dramatically alters the tone of Lee's voice. Prospective buyers are advised to consider obtaining item #4 instead. 1. Title: If I Could Be With You / Format: LP / Label: Starline's Sounds Rare / Cat. Num. : Sr 5008 / Rel. Year: 1986 / Tracks: 12 / Note: Contains two episodes of Peggy Lee's own radio show, one of them broadcast in 1951 and the other in 1952. 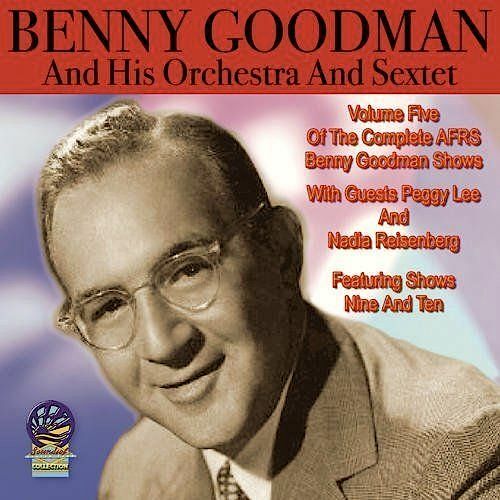 Former boss Benny Goodman is her guest in one episode, in which the numbers that she sings include "Toodle-Ee-Yoo-Doo," a novelty written by Goodman's then-vocalist, Nancy Clayton. 2 & 3. Title: If I Could Be With You / Format: CS & LP & CD / Label: Jasmine / Cat. Num. : (United Kingdom) Jasmc 2534 & Jasm 2534 & Jascd 2534 / Rel. Year: 1987; CD released in 1993 / Tracks: 12 / Note: Reissue of item #1 above. 4. 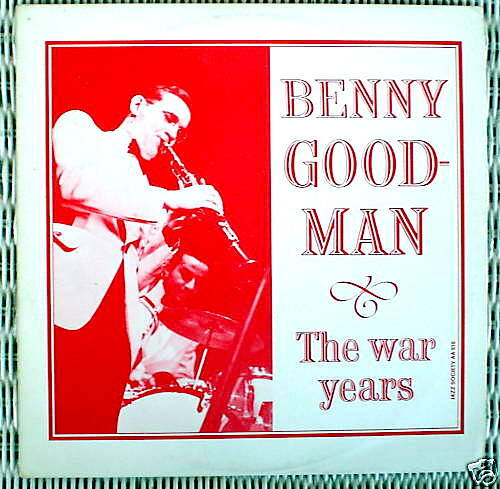 Title: Swingin' Through The Years With Benny Goodman (Benny Goodman, Volume 1) / Format: LP / Label: Giants of Jazz / Cat. Num. : Goj Lp 1005 / Rel. 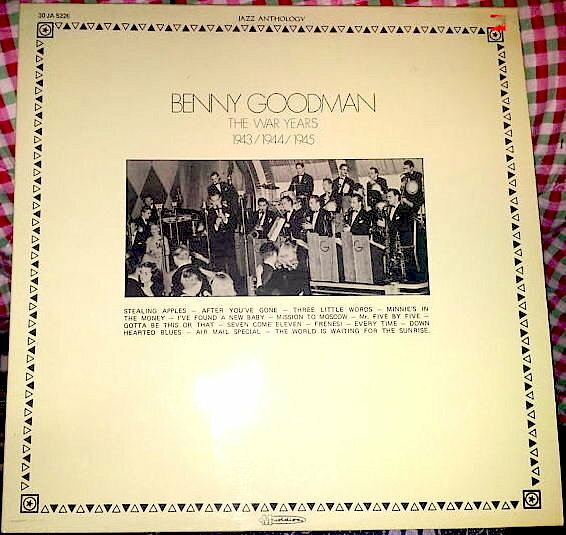 Year: 1977 / Note: Includes two tracks that were excerpted from the previously mentioned episode of Peggy Lee's radio show in which Benny Goodman guests. One of the tracks is a Goodman instrumental. The other track is the Peggy Lee solo "Toodle-Ee-Yoo-Doo." The following alphabetical list includes every album whose image is displayed in this page. To find a given album's location above, use as your guideline the Roman numeral that follows each title.